The new Sony VPL-VW1000ES bring True 4K resolution to your home! 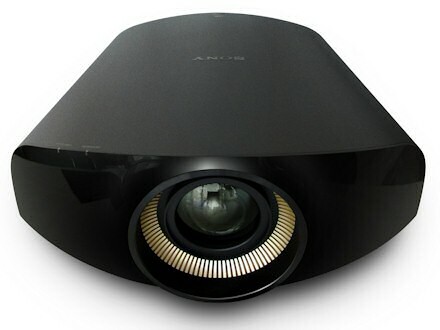 Sony has introduced to the home theater enthusiast the first True 4K projector (4096 x 2160). Why 4K? It’s all about image quality. The new Sony VPL-VW1000ES gives you over 4x the amount of pixels as standard HD, delivering for the first time true professional digital cinema quality at home. True 4K resolution virtually eliminates pixelation or screen door effect, and decreases jagged edges. Sony's new “super resolution” processing takes regular 1080p content and up-scales it to full 4K, and since the projector's resolution is 4K to start with, it future proofs your theater from the coming tide of 4K content, both 2D and 3D. This advanced scaling uses an edge-adaptive, motion-adaptive digital algorithm to achieve a smooth, lifelike image delivering a far superior image to standard HD. The VPL-VW1000ES's True 4K resolution in combination with Sony's Motion Flow technology removes the judder from fast motion images such as live sports events, and action scenes. In addition to the increased resolution, the VPL-VW1000ES has 2000 lumens, enabling screen sizes up to 200" diagonal for 2D viewing, and 150" diagonal 3D viewing. The new Sony SXRD chips (Silocon X-tal Reflective Display) in the VPL-VW1000ES now incorporate a series of manufacturing refinements that include improved aluminum etching and upgraded filler for the inter-pixel gaps which dramatically improves black levels. When combined with Sony’s Iris 3 technology, this raises the dynamic contrast ratio to 1,000,000:1. The Sony PL-VW1000ES offer the best in 3D viewing as well, thanks to the Sony's dynamic lamp control and the increased lumen rating. It is also compatible with more 3D formats including FP-frame packing, SBS-side by side (ESPN’s format), and OU-over under. Offering advanced 2D to 3D conversion, even standard content can now have a natural 3D image. Sony's VPL-VW100ES also offers a wider color gamut, including DCI and Adobe RGB, and supports Deep Color and x.v.Color, for superior color reproduction. Anamorphic processing in both 2D and 3D is also built in. If you haven't heard how incredible an anamorphic front projection system can be, take a look! With several installation features such as motorized lens shift, zone panel alignment, a 2.1x zoom, and a whisper quiet fan, makes this a perfect addition to any home theater environment. Finally, adding in a 3 year warranty and compatibility with the major control systems such as Crestron, AMX, and Control4, the new Sony VPL-VW1000ES brings the reality of professional digital cinema, to the home theater.